There was just a little over a cup leftover that I heated in the microwave for lunch and then added a small fresh tomato just picked from my plant on my deck. Oh, my gosh. It was so good! 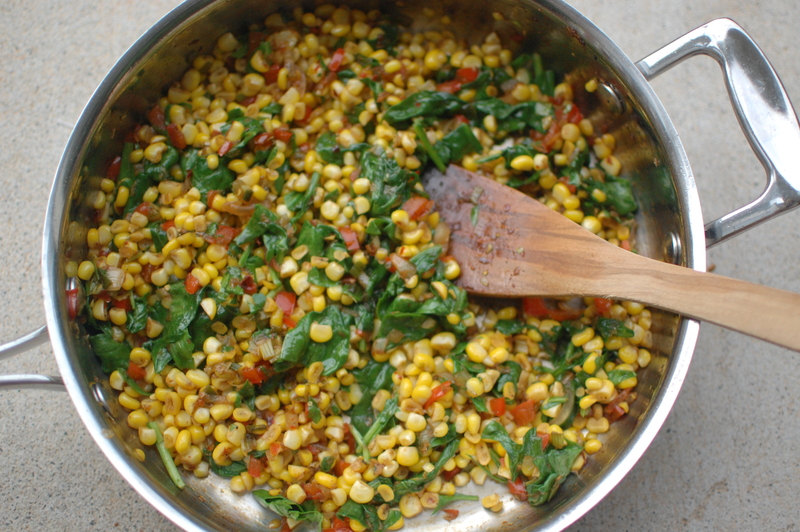 Slip in some other vegetables if spinach is not your thing, but that’s my favorite part. Enjoy the last part of your summer. Cook bacon in a large skillet. Drain on paper towel. Discard all but about a teaspoon of the bacon fat. Add shallot, chopped red pepper, scallions. Season with salt and pepper. Add red pepper flakes if you choose. Cook until tender 2-3 minutes. Add corn. Cook for about 5 minutes. Stir often. Add crumbled bacon along with spinach 2 cups at the time. Stir until spinach leaves have wilted about 1 minute. I learned that all of the ingredients makes it full of flavor. I didn’t know you can make corn with so many ingridinates. I’ve learned that you discard the bacon and leave the fat. If you don’t like spinach you can substitute it with other vegetables. I learned that you discard most of the bacon fat. Just eat the whole bowlful with nothing else is good for the whole meal. 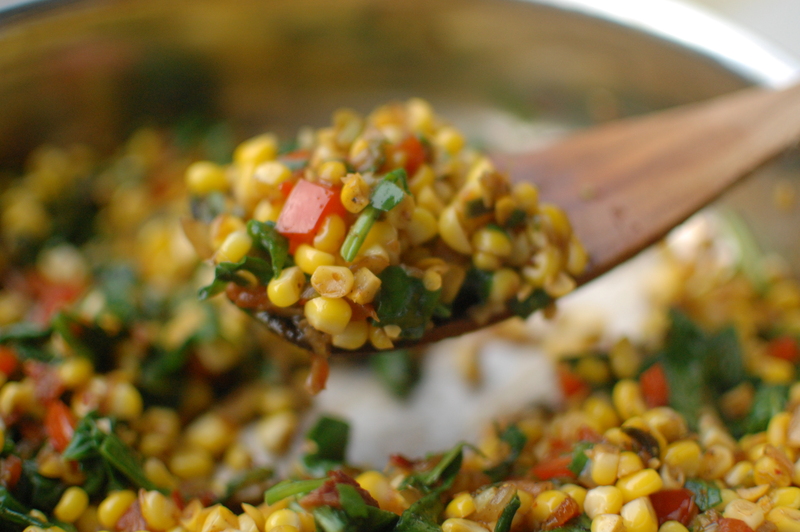 can you use mexican corn instead of off the cob? i learned that it has bacon in it. Using bacon fat is a good idea. You can substitute in any vegetable if you don’t like spinach. All but a teaspoon of bacon fat has to be thrown out. Everything but a teaspoon of bacon fat has to be thrown out. I didn’t know you could use bacon fat as added flavor. i learned that this only takes about 15 mins to cook. I learned that you can substitute a different vegetable for spinach. I learned that using leftover bacon fat to saulte the vegtables will help enhance there flavor. I learned that when shallots and scallions are done cooking they will be tender. I learned that you have to make sure you don’t over cook the spianch. I learned that you stir the spinach until it is wilted. I learned you could add bacon in it.